Still not seeing a profit in your fledgling trucking business? You could be burning through too many tires. Like human feet stuffed into shoes and forgotten until you’re limping, your truck’s “feet” might be neglected until you’re scraping on dips and chewing through tires at an alarming rate. Tires and wheels keep your vehicle in contact with treacherous roads, which cause wear and tear on tires. Neglecting your tires can be dangerous since a flat tire that shreds or throws pieces can do serious damage, up to and including a fire if your tire creates sparks. If your truck is your livelihood, you simply cannot afford to have your vehicle off the road for long. If you employ drivers, their safety and ability to make a living are priorities. If you want to be legal and stay in business, your vehicles must pass safety inspections. Although weather conditions, road conditions, and the driving behaviors of others can create hazards that are out of your control, you can take measures to minimize your risk of flats, blowouts, and other unwelcome surprises. Preventative maintenance is the best way to get the most mileage and years out of your tires—and avoid the infinitely greater expense of replacing tires. What can you do to maintain your tires and prevent premature tire wear? Check your tire pressure. Each time you over-inflate or under-inflate, you not only shorten the life of your tires, but you worsen your fuel economy. Over-inflated tires show the most wear in the middle, while under-inflated tires will wear most at the edges. Buy a good tire gauge and check your tire inflation each day that you move or drive your heavy-duty vehicle. Make sure you check the pressure when cold—never when hot. Also mind the temperature outdoors since tire pressure can be affected by changes in the temperature. Even if the tires look fine, you can’t be sure until you check the pressure. Small changes in pressure can really add up over time: tires can lose up to two pounds of pressure each month. Don’t overload your tires. Always weigh your vehicle when it’s fully loaded. Include all passengers, cargo, and tow load. Weigh each axle end separately to be sure you don’t exceed your tire ratings and to ensure your loaded weight is properly distributed. Beware the sun. UV rays are as bad for tires as they are for human skin. Ozone in the air can cause dry rot in the sidewalls of tires. When your vehicle is parked, cover the tires to block out harmful UV rays. Rotate your tires. A telltale sign that you need to rotate your tires is when one tire wears faster than another. Check your manufacturer’s recommendations for tire rotation. Wear and tear can decrease the lifespan of your tires. Make time for regular tire rotation every 5,000 miles or at intervals recommended by the factory. Beware old tires. Your tires may look good, but check their dates of manufacture. If your vehicle was made in the United States, you’ll find a DOT number on the inside sidewalls which tells you how old the tires are. If you’re not sure how old your tires are, have them professionally inspected. Get routine alignments. Misalignment can be caused by damages from collisions/accidents, nudging a curb, driving off road or on uneven surfaces, replacing a steering joint, to name a few causes. Even a misalignment of 1 degree can cause tires to fail long before their time. Signs of misalignment on tires can include uneven tire wear over the tread, wear at the shoulder of the tire, and premature aging despite having recently replaced a tire. An alignment can halt premature tire wear in its tracks. 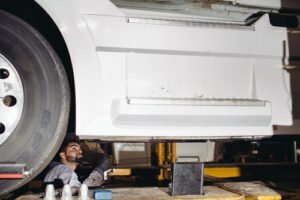 During an alignment, a technician will get a good view of your axle and suspension parts, including leaf springs, bushings, air ride suspension systems, shocks, and other parts. If anything needs to be repaired or replaced, you might have it done at that time. Toe out is when your truck’s wheels point out to the sides. Toe in is when the wheel point to the inside. Whatever the case, improper toe will create problems and increase wear on your tires. Tracking misalignment will cause irregular tire wear in the steer tires. Bee Line gauging equipment uses lasers to measure for proper toe and sets the tracking parallel to the centerline of the chassis. Too much camber causes wear on the outer half of the tire tread; too little camber will cause tires to go bald from the inside out. Caster is the angle of the front axle, which can affect vehicle handling. Bee Line allows the perfect camber and caster settings for your vehicle. This ensures the best axle correction for longer tire and vehicle life. Checking a vehicle’s turning radius is essential for a proper alignment. If you notice irregular shoulder wear or feathering, you might have an improper turning radius. Bee Line equipment measures and displays the Ackerman Angle for proper turning radius. KPI is the angle needed to pinpoint bent spindles, bent king pins, and more. Reading KPI is essential to the proper alignment of a vehicle. Some shops use alignment systems that provide only basic angles in their standard readout. Bee Line measures true KPI. Save money on fuel. When your wheels are misaligned, your engine must work harder to move your vehicle, which requires more fuel. It’s best to get your fleet of heavy duty trucks on a maintenance schedule for regular wheel alignments since misalignment can be so subtle you don’t notice it until the damage has been done. Lower your emissions. Regular alignments can reduce carbon dioxide and other harmful emissions emitted from your commercial vehicle. Preserve your whole truck. When kept in balance with regular alignments, the other mechanical parts of your truck will be less stressed and have a longer life. Increase driving comfort and safety. Once your vehicle is aligned, you’ll also notice a much more comfortable drive. You won’t be fighting the vehicle to move in a straight line. Also, you’ll also enjoy safer handling. Even a seemingly “slight” adjustment in wheel alignment can make all the difference in driver comfort. Because of increased tire and fuel costs, harmful emissions, and driver fatigue, many trucking companies have turned to our laser technology at Vancouver Axle and Frame. Our equipment provides the most accurate method of wheel alignment. For best results, you should get your wheels aligned every 12 months at a minimum. You might coordinate your alignments to be done right before your annual safety inspections, and then keep your fleet on an ongoing schedule. Between your annual inspections, monitor your tire wear regularly. Any uneven wear you see is a red flag for misalignment. Have you added new vehicles to your fleet? Has your vehicle been in an accident? Bring those vehicles in for alignment before putting them back on the road. Get the most life out of your tires: make alignments part of your vehicle’s or fleet’s preventive maintenance program! Contact Vancouver Axle and Frame now to set up your heavy-duty truck alignment. We’ll place you on a preventative maintenance program. Our diagnostic technology, combined with our knowledgeable, honest staff and spacious, organized shop, sets us apart for alignment services.